The Allen County commissioners proposed a 0.2 percent income tax increase to help renovate buildings, such as the Allen County Courthouse, and build new facilities. LIMA — The Allen County Commissioners laid out a plan for a 0.2 percent sales tax increase to be voted on this May to pay for increasing maintenance and structural costs of aging county-owned properties. The sales tax increase would raise $3.5 million annually over a period of 10 years, which would pay for capital costs at four different buildings — a new Allen County Juvenile Detention Center, renovations to the Allen County Courthouse, a new County Engineer’s Office facility and new county administrative offices. Commissioners said the increase would allow them to take a more precautionary approach to keeping the buildings maintained rather than a reactionary one, which ultimately could prevent the higher costs of emergency maintenance and keep the commissioners from having to borrow additional funds. Allen County’s current sales tax rate is 6.75 percent, tied for the lowest in the region with Hancock County. Putnam County has a rate of 7.0 percent, while Auglaize, Hardin, Logan, Mercer, Shelby and Van Wert Counties each have a 7.25 percent rate. During the plan’s reveal spun out during the Rotary Club of Lima’s Monday meeting, Commissioner Greg Sneary touted the commissioners’ efforts to increase efficiencies across the board. “One thing you always have to do though is be very careful about what you’re doing, and of course, over the years, one thing we’ve done is innovation and trying to save where we can with efficiencies. And that’s happening in a number of areas over the years,” Sneary said. But recent structural problems with many of the county’s properties, many of them older than 25 years, made it apparent that more needs to be done to prevent further costly maintenance emergencies. Begg said the evolution of the sales tax plan began when damages from the courthouse, primarily a large hole on the west side of the clocktower, resulted in evacuation of the fourth floor. The original idea was to make repairs while continuing to use the rest of the building, but it became apparent that construction would disrupt court proceedings. Additionally, extended talks with other county department heads convinced the commissioners that other facilities needed to be expanded or maintained at a greater rate than current funds allow. While the current budget could allow these problems to be fixed over time, Sneary said, a sales tax increase would allow the county to address these problems more immediately and avoid higher costs down the line. “We’re planning with this timeline to not have to borrow very much money. I’m sure there will be some cash flow needs especially when it comes to the courthouse. Hopefully, we can get the courthouse done before we collect all that money. But we have the ability to borrow somewhat from ourselves,” Sneary said. The 10-year plan would allow the county to pay for and finish each building before construction begins on the next project. The years of 2019 and 2020 would see the construction of the Allen County Juvenile Detention Center, currently ongoing and estimated to cost $7.1 million, followed by new county administrative offices, a $3.5 million project, the renovation of the courthouse costing $11 million and then a new County Engineer Office’s facility, estimated to cost $7 million, to be finished if all goes according to plan by 2029. Courthouse renovations, outside of improvements to the roof, would also include an extensive look at the building’s security for court personnel, Begg said. “Many of renovations that we’ve planned are not only for much needed updates and efficiencies, but a lot of it is for the increased security that we’ve come to need for our judges and their staff. There’s been a number of problems where judges have been — I don’t what to say attacked, but threatened, and I guess they have been attacked — and we want to make sure we have a very secure facility where they can park and enter their courtrooms without worrying about crossing paths with as much as the public as possible,” Begg said. If any funds remained, they would be allocated to permanent improvements on the Allen County Jail, the Third District Court of Appeals and the Annex, or the old title building as well as infrastructure improvements on county roads and bridges. Commissioners said the plan would also shuffle some of the current county departments into other facilities in order to increase budget efficiencies. All Allen County Common Pleas courtrooms, four in total, would be run out of the courthouse alongside the Allen County Clerk of Courts. The Allen County Treasurer’s, Recorder’s and Auditor’s Offices, which currently are located in the courthouse, would be moved into new administrative offices. Other attempts to raise the sales tax in Lima and Allen County have failed in recent years. Just this past fall, Allen County’s voters turned down a 0.25 percent sales tax to fund the Allen County Regional Transit Authority, and in 2009, Lima voters turned down a 0.5 percent sales tax for the general fund. As for the historic Memorial Hall, the sales tax increase plan would not contribute any funds to its potential rehabilitation. The current state tax rate is 5.5 percent in Ohio and 6.75 percent for Allen County. The commissioner’s tax rate would increase that number to 6.95 percent. The total combined tax rate, including state, county and transit authority is not allowed to exceed 8.5 percent. 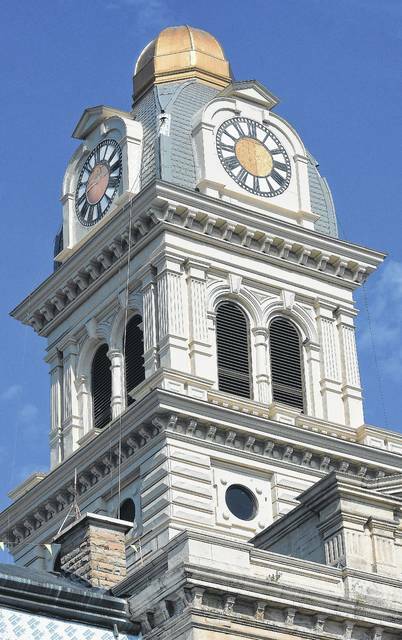 https://www.limaohio.com/wp-content/uploads/sites/54/2018/01/web1_Clock_tower_01co-1.jpgThe Allen County commissioners proposed a 0.2 percent income tax increase to help renovate buildings, such as the Allen County Courthouse, and build new facilities.